Pierre Le Roy, maître in 1721. Three identical cartels d'alcôve are known with cases stamped by Saint-Germain (maître fondeur-cisleur-doreur in 1748); the first, with movement signed Etienne Lenoir (maître in 1717), is illustrated in Tardy, La Pendule française, Paris, 1974, Vol. I, p. 188, fig. 1; the second, with movement signed Gosselin (Jean-Philippe maître in 1717 or Jean-Baptiste maître in 1743) in H. Ottomeyer and P. Pröschel, Vergoldete Bronzen. Munich, 1986, p. 116, fig. 2.5.7, and the third in P. Kjellberg, Encyclopédie de la pendule française, Paris, 1997, p. 95, fig. 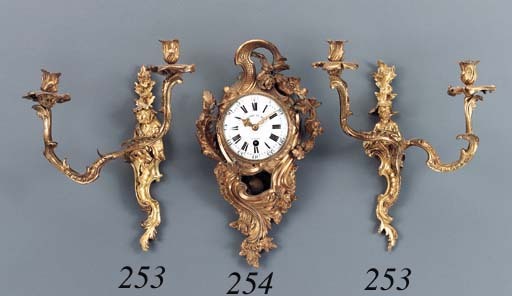 f; two other cases of this model are not stamped, one, signed Perache (Jean-Pierre, maître in 1733), missing the end of the flowering branch on the left side of the asymmetrical arched cresting also illustrated by Tardy (Vol. I, p. 187, fig. 1) and another formerly in the collection of the Duke and Duchess of Windsor (sold Sotheby's New York, 16 September 1998, lot 2079 ($17,250)).